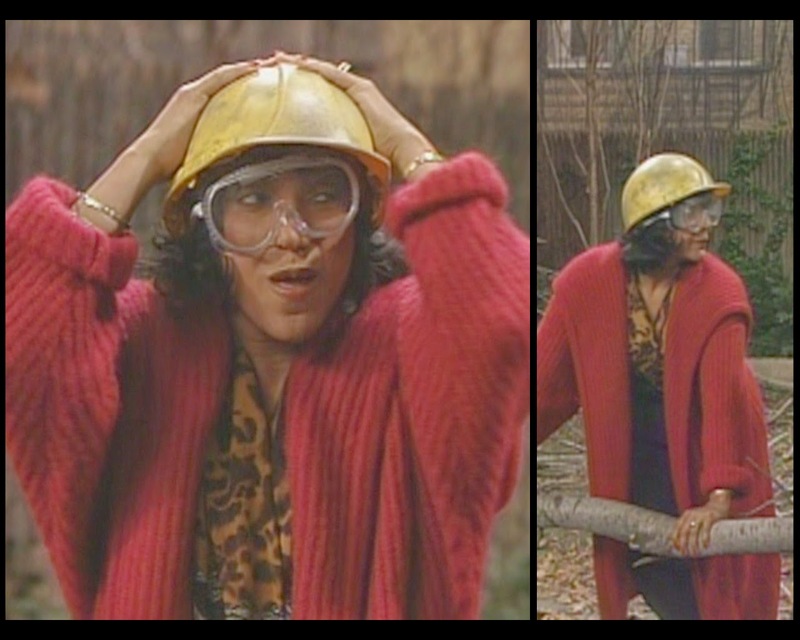 The Huxtables can be so holier-than-thou sometimes. 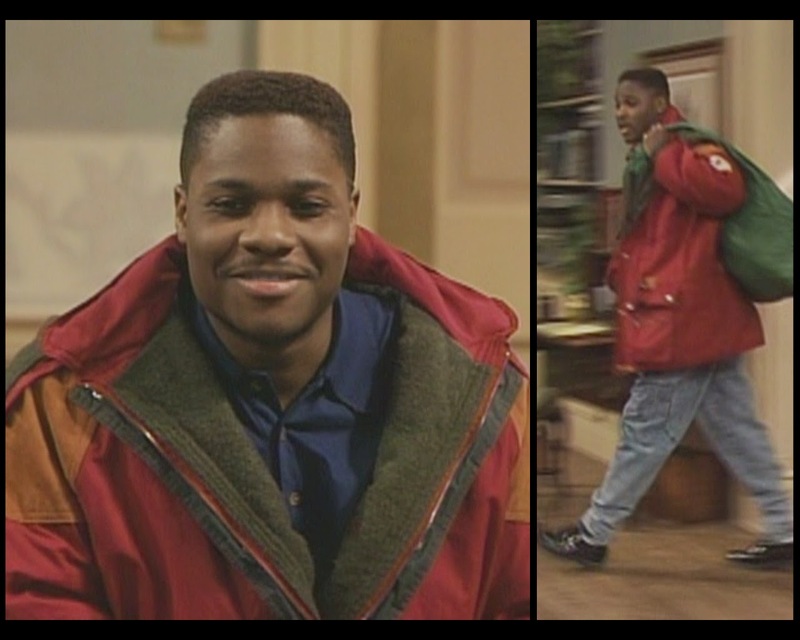 When Cliff and Clair discover that Theo has moved in with Justine, they get all high and mighty about how he's in school to study and he needs to be truthful with them and yadda yadda, and then he pushes back with the whole "giving me money doesn't mean you own me and you don't know my life" situation, and then meanwhile Denise is discovering that she has a 375th life goal of helping people with learning disabilities because somehow she's going to change the world... basically everyone in the house is insufferable. At least the whole episode takes place over one day, so there aren't as many bad outfits to critique. We'll start off with an easy one: Georgia Strauss as the server at the cafe. There's apparently little in the way of a dress code at this place; everyone wears a vest and short apron, but the rest is up to them. This lady has gone for some TGI Friday's flair to accentuate the crappy t-shirt and hippie skirt. I bet she fancies herself to be a real free spirit. Or, saints preserve us, an old soul. Don't hang out with this girl after work. Paula's back; she's still a part of her daughter's life and still friends with Denise, which is legitimately awesome. The show is has a weird mix of conservative and progressive values, and in this case it's nice to see the focus on letting families take different and unexpected forms. I'm into the giant '80s sport coat, especially with that not-quite-plaid plaid; I actually wish that the skirt had a matching pattern to tie things together. She might be trying a little too hard with the scarf and shirt, though. 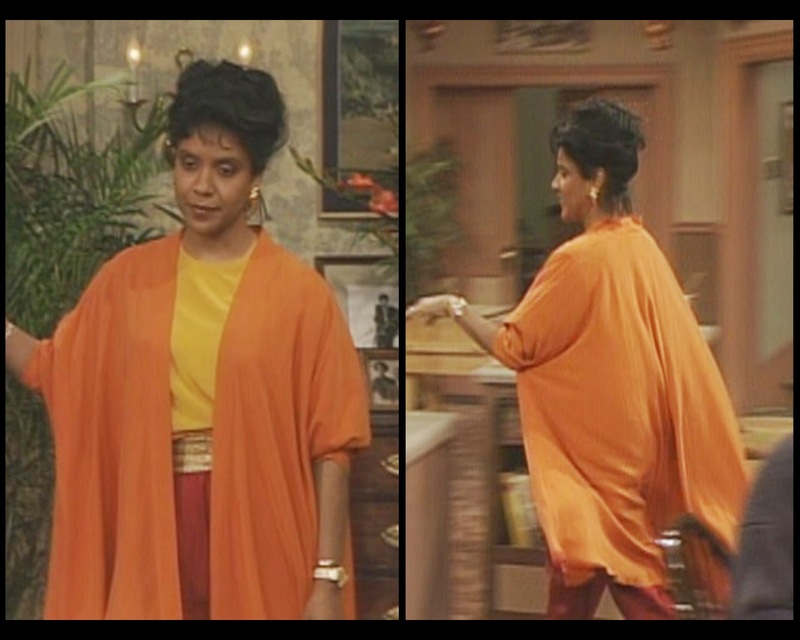 Embrace solids, Paula. Even a beige can fight for attention when you push it like this. The "before" picture in a salon commercial. 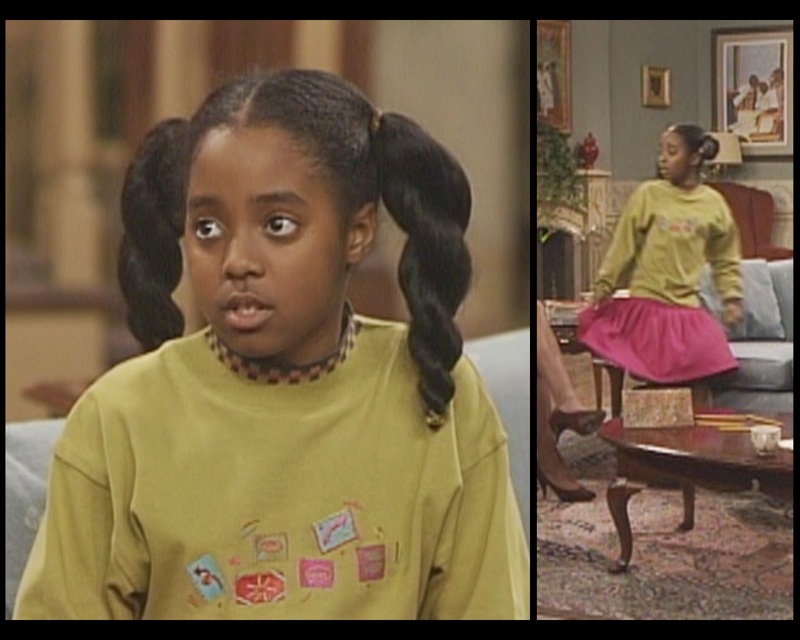 Oh, Justine, what is that bird's next on your head? Not cute, hon. 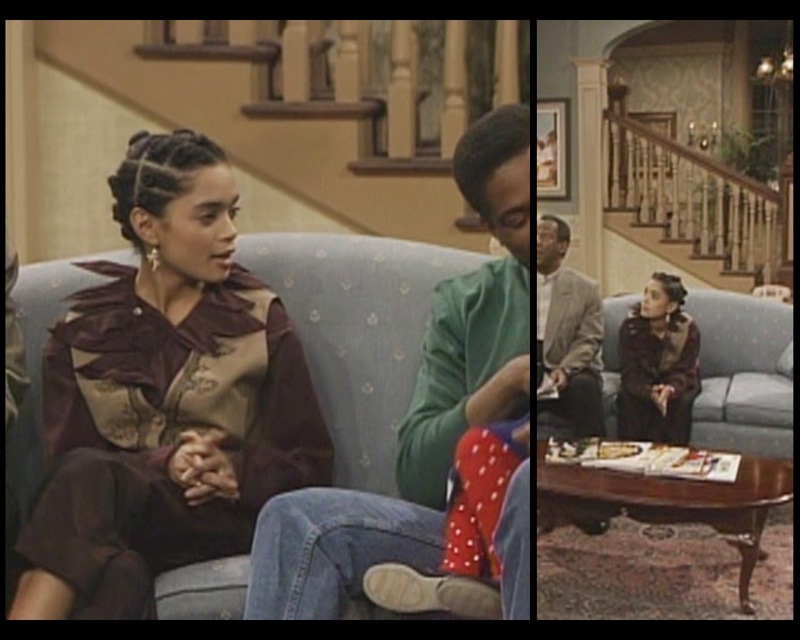 As for the saggy dress, we first saw it in episode #5.21, when it was worn by her roommate, Delores. It doesn't look better here. Nothing looks good here. This is an all-around failure. She's even caught Loafy Mock Turtleneck Disease from Theo. That's what you get for moving in with a fashion victim I guess. 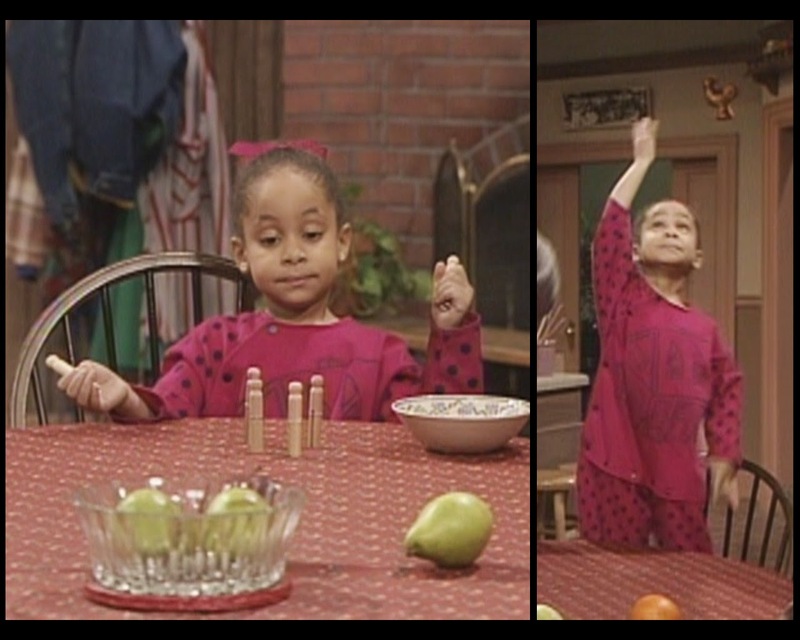 Olivia serves up her episode #6.12 clown shirt. Why is Rudy the only one who ever does chores? Rudy's outfit is kind of lame, but it's also laundry day, so I'm going to grant her a pardon. No one should be judged by their laundry day clothes. Theo lives every day like it's laundry day. I'm actually not totally opposed to the color combo he's rocking up top, though a cardigan over a turtleneck (or, naturally, a mock turtleneck) isn't really my jam. And everything's too big. And don't even try me with that hat. Well, you can't say she's not putting in some effort. You know, I always want to champion Denise's kookiness, but this is a little outside the bounds even for me. Everything has got to be a thrift shop find, judging by the early '70s overall vibe and the fact that the coat is obviously made for a large man. The flare of the pants anticipates the '90s boot cut jean trend, though the color scheme and the width of those stripes make her seem kind of circus-y, especially when you factor in the big used car salesman jacket. The loose, ruffly sleeves and big buttons on her blouse might work in another setting, but here there's already too much going on. Again, I do my best to like whatever she does, but I can't just throw my support down blindly, and you'd have to be blind to support this. She lives her life like a candle in the wind. I wasn't overly fond of any of this until Clair got up and walked across the room and I saw that orange top garment billow. That right there is a statement piece; it looks simple, but work that strut and all of a sudden you are throwing down goddess energies. In that context, I can understand the simplicity of the outfit and the color scheme. This isn't fashion so much as cosplay: she is a fire elemental. But hey, dress for the job you want! She's nailing it. 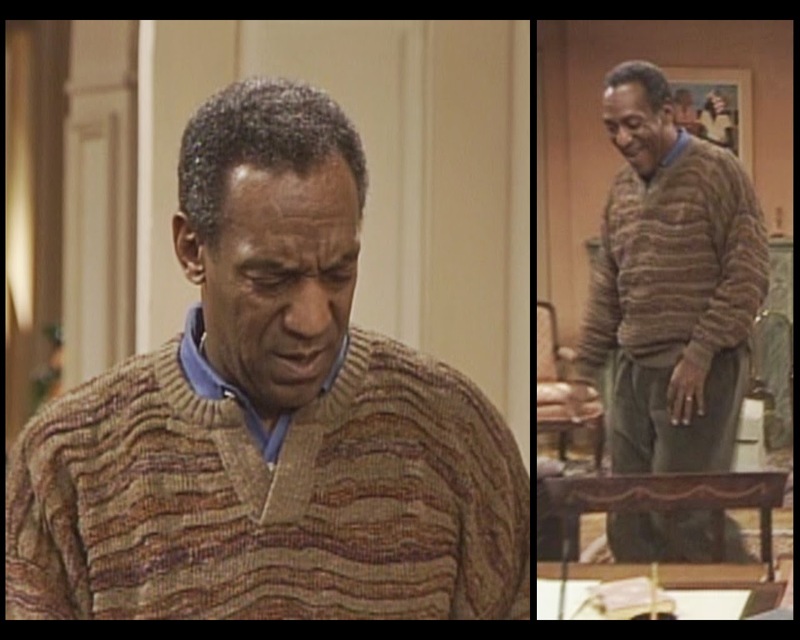 When Bill Cosby had an internet poll to choose the ultimate Cosby sweater, fans chose this one as the winner. I can't really review it in light of that development. This is it, you guys. This is the one. Nice slacks, I guess. We're zeroing in on season 7. Who's excited? Season 6, Episode 20: Isn't It Romantic? This is one of my all-time favorite episodes, but really only for the last two minutes. The build-up: Theo tells his father, Martin, and Elvin that they no longer have romance in their lives because they are married. The husbands decide they will have a contest to see who can impress his wife the most with a romantic gift that costs under $25. The rest of the episode is standard stuff, with a lot of stalling to show that Cliff has no idea how he's going to pull through on this one. But his last moment with Clair is completely terrific both in terms of how it's scripted and how it's acted. She will play you like a violin. Olivia's appearance is interesting because it is one of the few moments in the series that goes for a running gag. 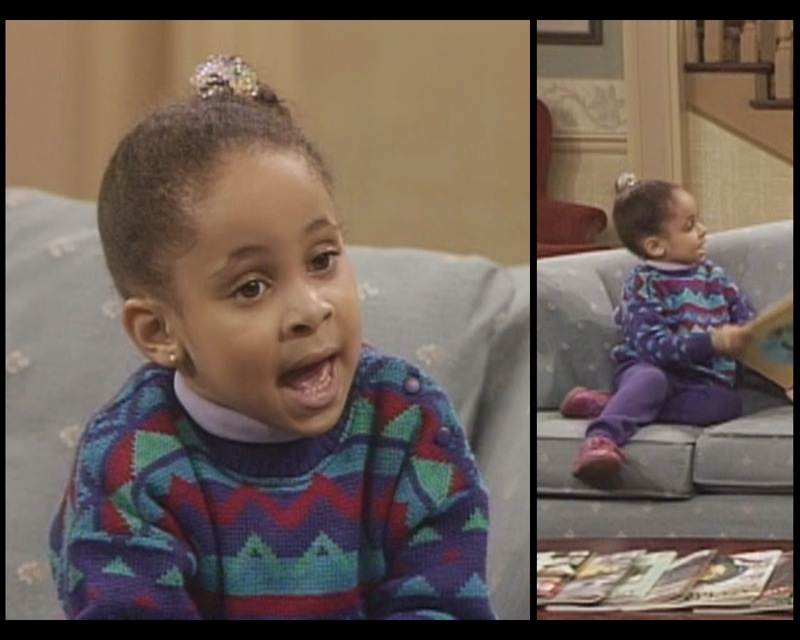 Back in the birthday episode, when Olivia wanted Cliff to help her find her tricycle, he stalled by looking at his hangnail and then gave her bogus hints. 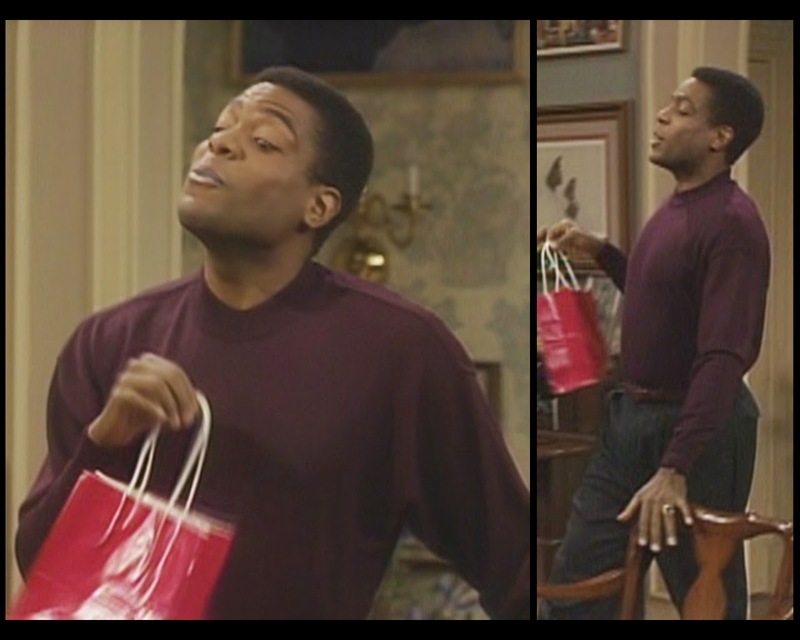 This time around, when he asks her about the gift that Martin got Denise, she plays the same tricks right back. It's a clever bit. 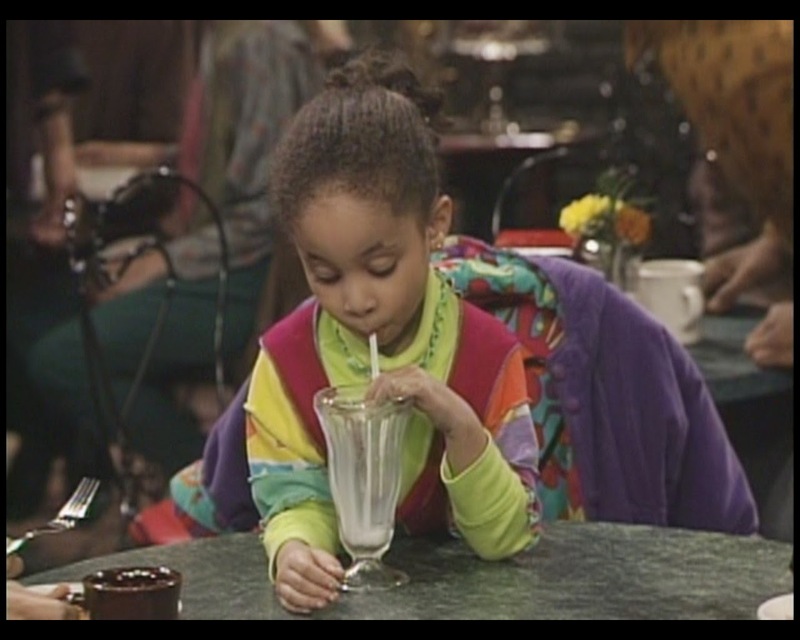 As for the clothes, this is perhaps the first time we've seen a dark gray from Olivia, and it feels wrong. The brighter shades are more in her wheelhouse, but that argyle is pretty severe by her usual standards. Let me borrow that top. Though Rudy technically shows up on screen this week, she has no lines, and thus I feel comfortable skipping her. Vanessa barely speaks, but those few words get her into the blog. There's not a ton to comment on about her wardrobe. Solid work on the jeans, and there's not much you can complain about elsewhere. I like that her tee is printed all over, which is superior to a plain shirt with a graphic on the front. Also, whether by initial design or her own personal scissor work, it's cut irregularly along the bottom in a way that actually kind of works. The best choice here is that pair of tassel earrings, though. Fantastic accessory. It's never not ugh with this one. Oh, Theo. Mock turtleneck? Check. Boring colors? Check. Long, disgusting rat tail? Check. I worry about this man's future. Blue shirt and tapered jeans. I've come to dread his appearances, truly. My first wish is for a change of clothes. 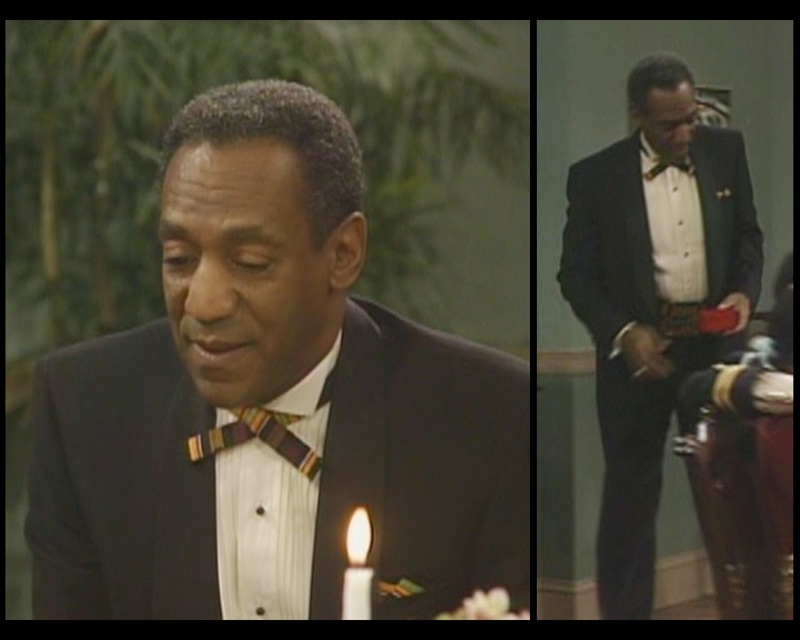 Denise appears at the end in her version of formal attire for the big dinner scene. She doesn't typically show this much skin, or if she does, she chooses less conventional patches of skin to show off. (I recall her opting for a couple weird back cutouts, for instance.) So this low-cut, midriff-baring I Dream of Jeannie look doesn't seem right for her. The voluminous pants are OK, though the thick cuffs and flashy belt look a little cheap. But the top comes across like a heavily altered t-shirt, making this getup overall feel distinctly less dressy. The tone doesn't fit the occasion, and I know she can do better. Hey guys, did I mention I'm in the military? 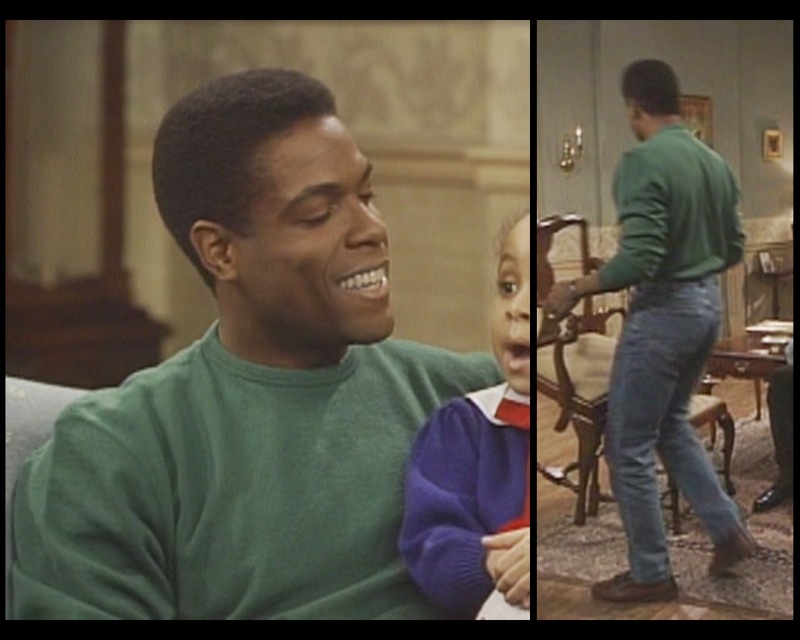 Since the show opens with the men doing yard work, I can't fault Martin for his sweatshirt and jeans. The costume department will take absolutely any opportunity to remind you that he's a Navy officer, though, as evidenced by this logo. I don't know why he's walking like a fancy lady. Eggplant mock turtleneck. At least he didn't pair it with those mom jeans he's always wearing. Still, that top is something Theo would wear, and that can no longer be viewed as a compliment. 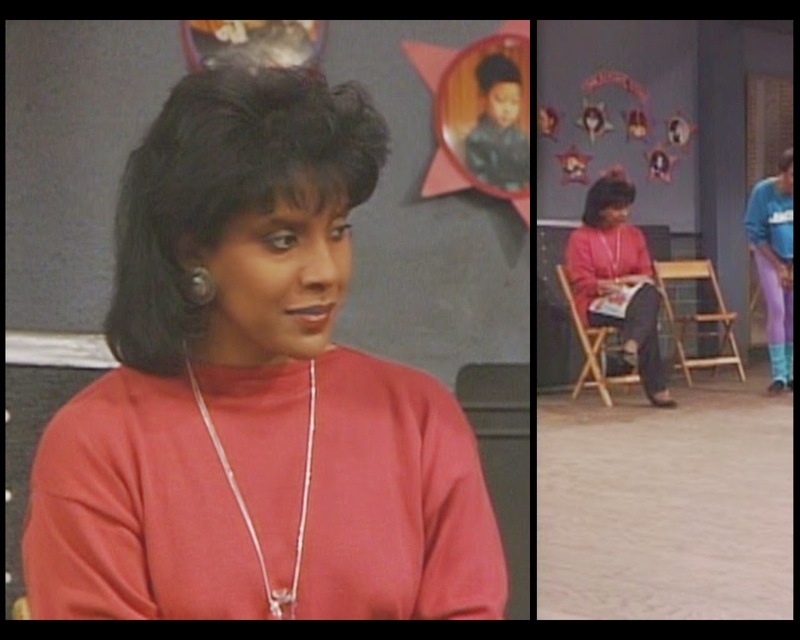 It's all about Denise's face in that shot. 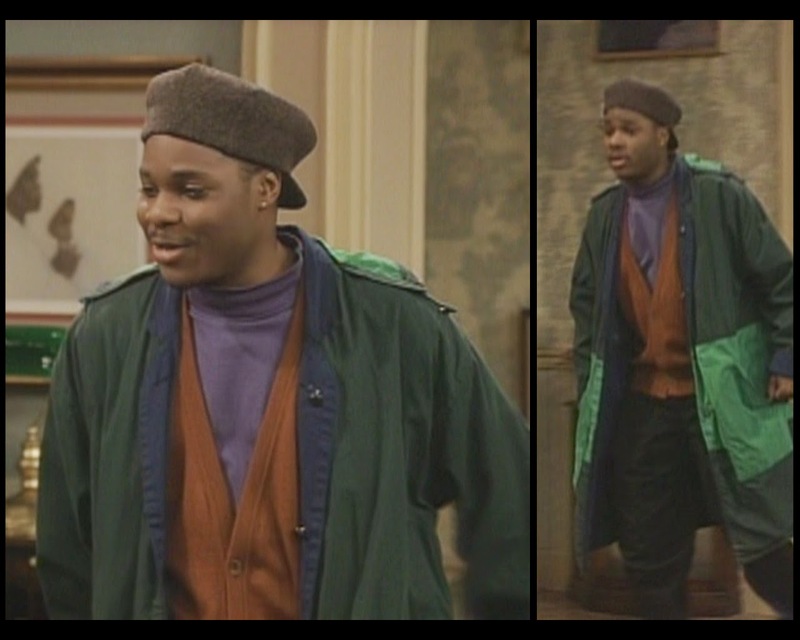 This is Martin's dress uniform, which he's also wearing in this season's opening credits. It's rare that I have anything nice to say about Sondra, but I'm actually fairly excited about this skirt/leggings combo. It's easier to see in motion, but the parts that aren't golden are actually transparent, meaning that you can completely see her legs through the outer garment. It's a daring move that has the potential for disaster but ends up being pretty fabulous. The structured blazer on the top is what holds it together; something diaphanous and silky would probably make this whole getup come across as flimsy. I'm really into the staunchness of the jacket and its heavy fasteners against the barely-there lower part. And who's going to say no to black and gold as a palette? 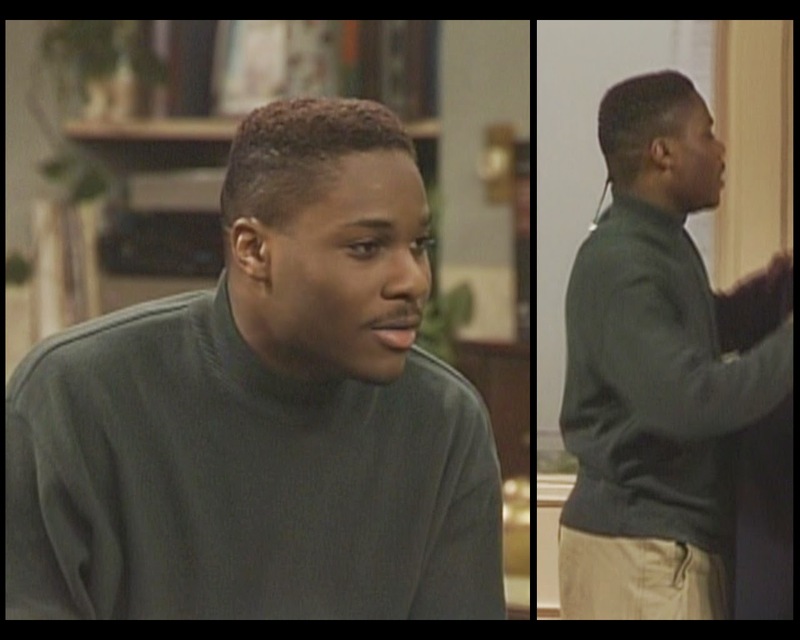 Elvin first wore this shirt in episode #4.8. The splatter of paint or bleach on his work jeans is a nice detail. And a tux. Everyone looks good in a tux. 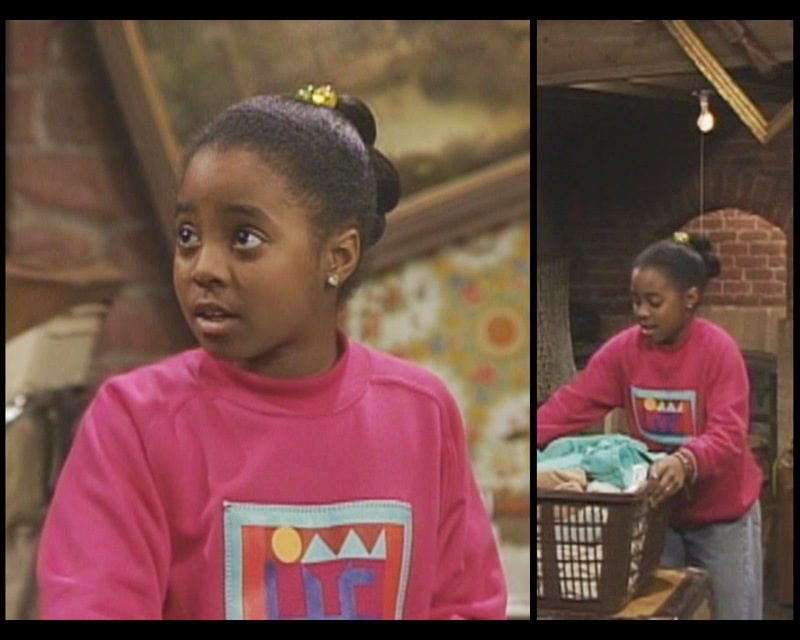 Clair makes a brief appearance early in the episode to revisit her long-lost episode #2.7 sweater coat. There's some sort of animal print blouse going on as well, and I have a feeling that I wouldn't be a fan of it if I could get a full view, but I'm going to withhold comment since the entire outfit is never revealed to us. Stank and swank at the same time. Of course, when Clair wants to get regal, she can get good and regal. 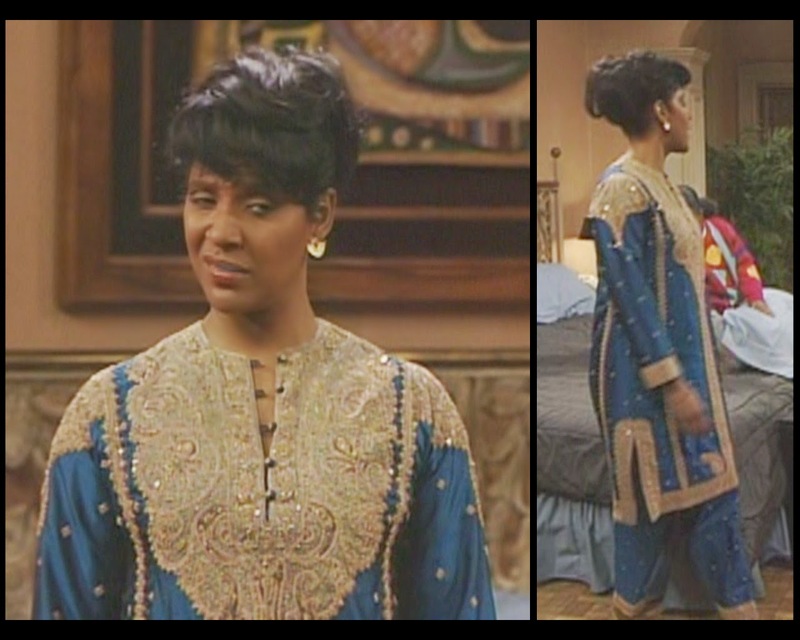 Her daughter might be playing with some costume-in-a-bag version of Middle Eastern fashion, but Mrs. Huxtable has salwar khameez realness happening here. The shimmer of the fabric makes me hesitant to classify the specific shade of blue she's wearing, as it fluctuates from bright lapis lazuli to rich sapphire to deep midnight. It's beautiful on her, especially when joined with the ornate pale golden embellishments. This is a stunner of a presentation. Cliff starts the day in jeans and a hoodie. Moving on. The K stands for... something, I'm sure. 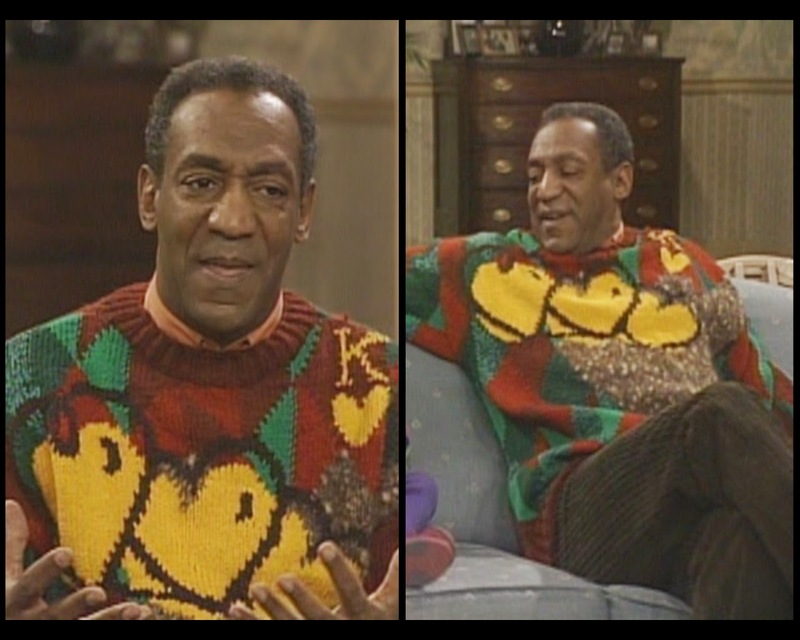 For his second day, he facilitates the romantic shopping process by wearing a sweater with giant yellow hearts on it. 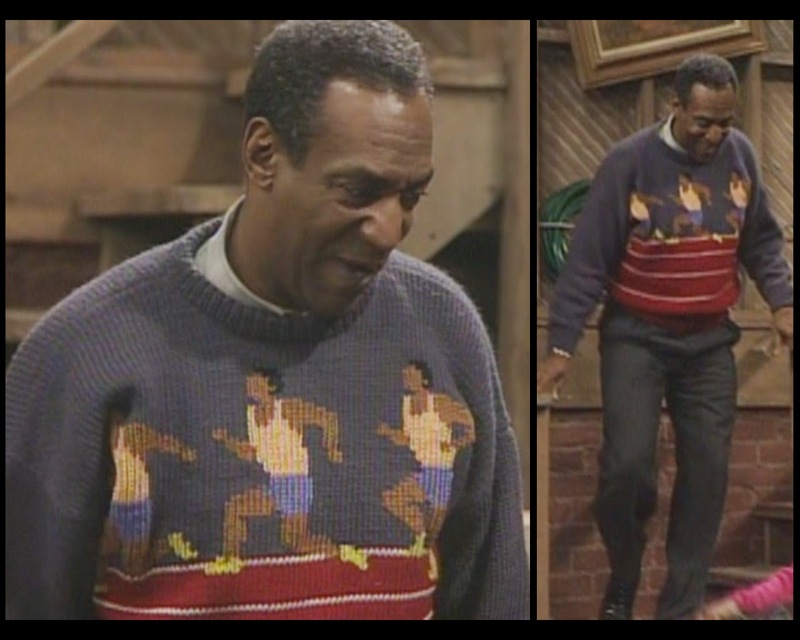 I'm not into the obvious symbolism, and in terms of fashion, this is of course a piece that only looks good on Bill Cosby. In particular I'm squeamish around bright red and bright green being used together prominently, because there's such a strong Christmas association there and it's hard to employ those hues outside that context. Nice work with that salmon collar, though. The brown corduroys with the thick welt are also great. Everyone looks good in a tux. To close, I'll leave you with a brief, blurry video of Cliff presenting his gift to Clair. 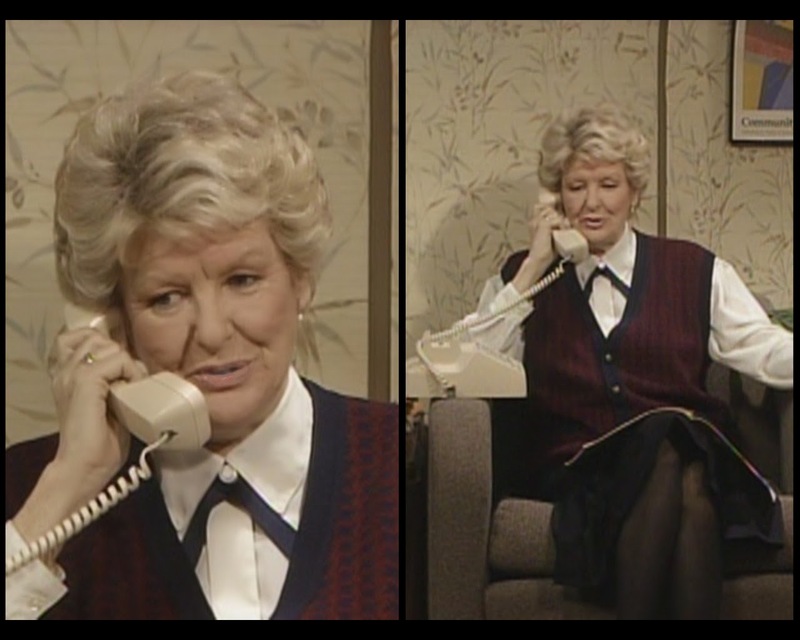 Her enunciation of "tacky" (that adds extra syllables and a full-on H sound) is easily one of the best single words ever spoken on television. Enjoy. But back to business. This week, Rudy slouches on her duties as the representative female tap dancer in her class. She's been assigned to perform alongside a trained tapper, and rather than try and fail, she's opting to quit while she's behind. I know the feeling. Of course, her teacher and parents are having none of that. 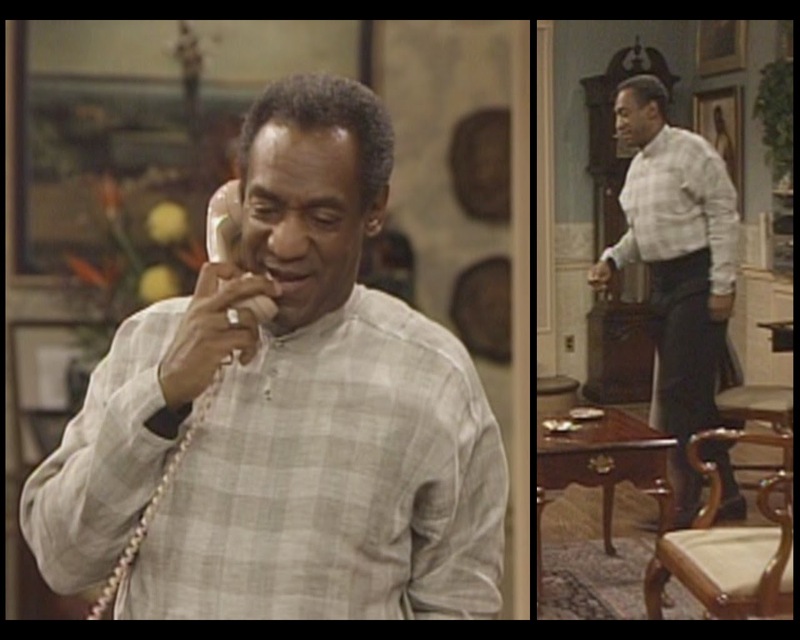 Mostly, the whole episode is an excuse for Bill Cosby to do several minutes of fake dancing. To be fair, it's a hysterical bit. 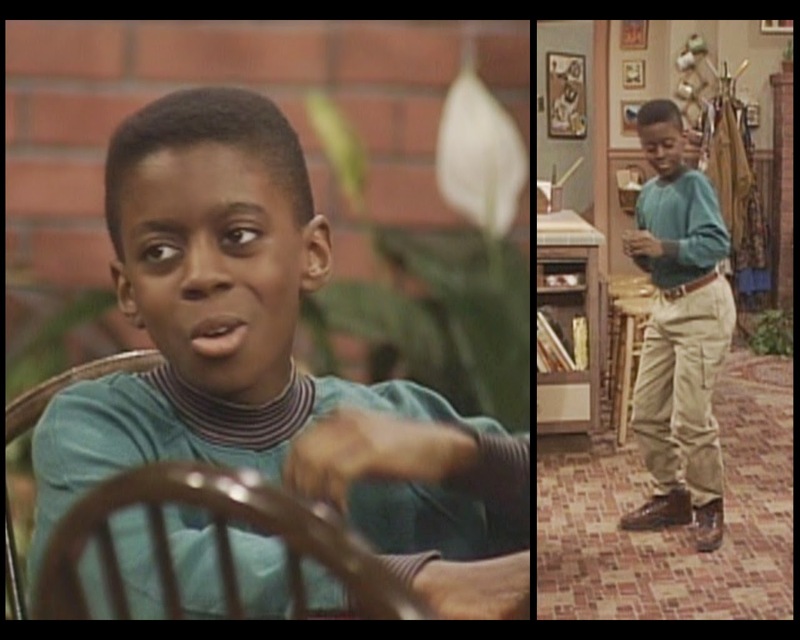 The episode gets its name from the participation of Howard "Sandman" Sims, a renowned tap dancer who plays himself as the owner of the dance studio where Rudy studies. He's not dressed like anything special, so just focus on his dance moves. He could have gotten these clothes out of a lost and found bin. And yet we never see her actually dance. 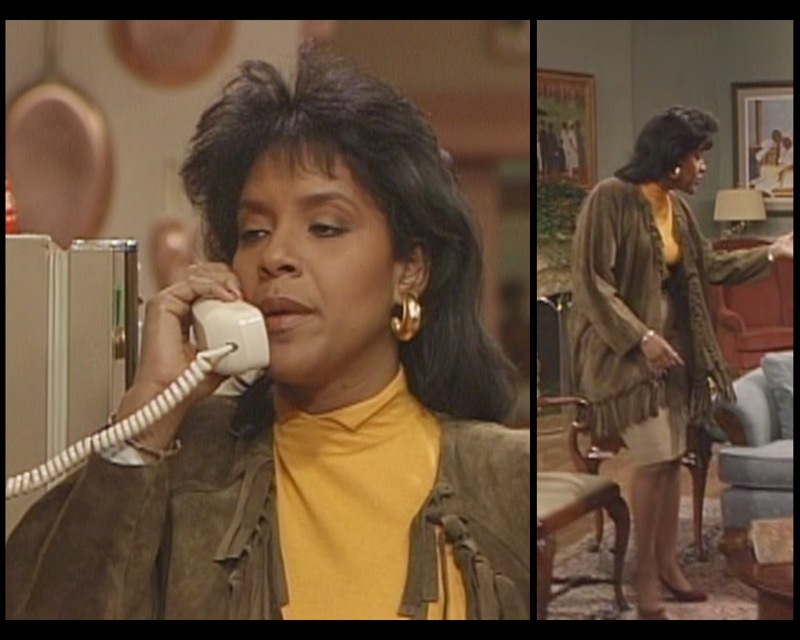 Shirley Black-Brown plays Mrs. Mitchell, the choreographer who is helping Rudy and her partner with their act. She wears workout clothes. I should note that she, Mr. Sims, and some other characters appear in a montage later in the episode, and I neglected to include every outfit depicted because mostly they're just in dance gear, and there are already a lot of looks to get through without including the stuff that's only shown for a few frames. Point is: this lady is geared up for rehearsal, and I'm not going to pretend like this is a runway situation. Mrs. McGee returns for this story in two brief segments, both of which involve her seated in a teacher's lounge or some similar location, talking on the phone. 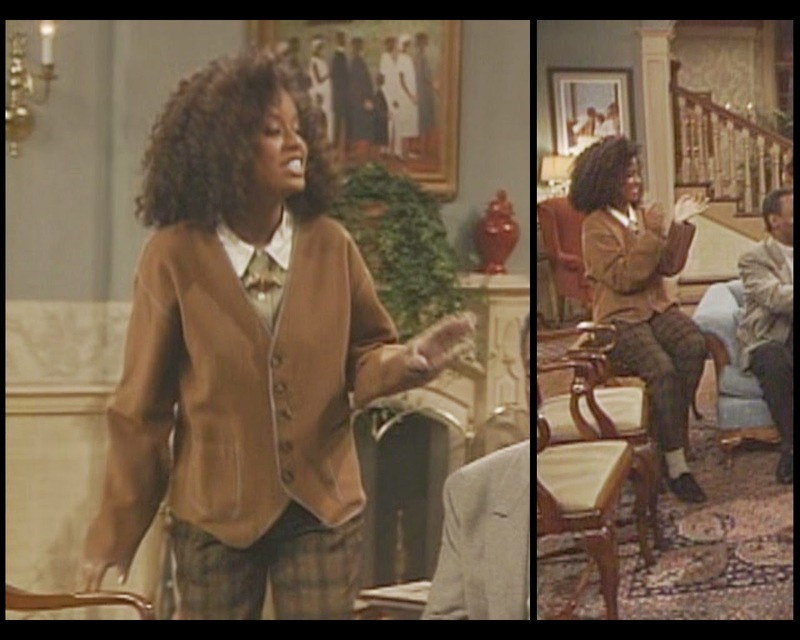 Her overall aesthetic has not changed: white shirt, sweater vest with shoulder pads, crossover tie, below-the-knee skirt. Something about the color combination of this one says "Marriott Front Desk" to me, but it's no better or worse than any of her other offerings. I like her in a standard men's tie. And a lighter skirt. And a cardigan. I like all of this, really. Also, she does better without the giant glasses from previous episodes. Overall: improvement. Typical: you buy her dolls, she plays with clothespins. I had assumed that Olivia's episode #6.5 shirt had fish built into it, but this outfit suggests otherwise. The blue top is a new garment, but those are the same red, green, and purple sea creatures swimming across her chest. Interesting. This lok has a similar vibe to her birthday creation: lots of rich pink and volume. I'll give Olivia credit for having a clear point of view. She's really into bold colors and exaggerated silhouettes. In some ways, she has a more consistent stylistic perspective than anyone else on the show. It's tough to pull off a nautical look without coming across as costumey, and this is one of those instances where the getup makes you look like Daffy Duck. I dig the polka dot tights though. Repeats make my life easier even when they're ugly. 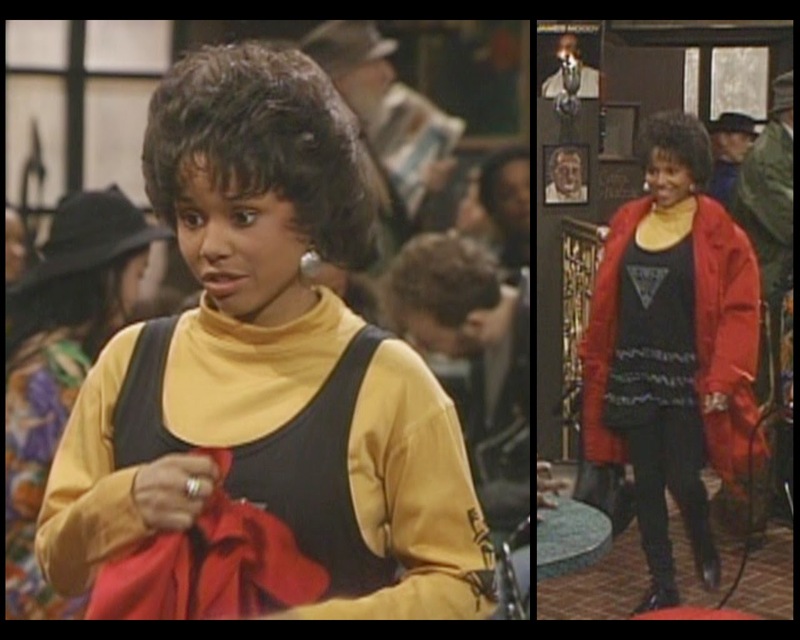 Rudy repeats her episode #6.6 outfit, minus the leggings. It's nice to see that the skirt catches some real air when she turns around. Your parents spent a lot of money on those tap shoes, kids. Rudy's episode #6.13 outfit has been demoted to workout clothes. It's probably for the best. 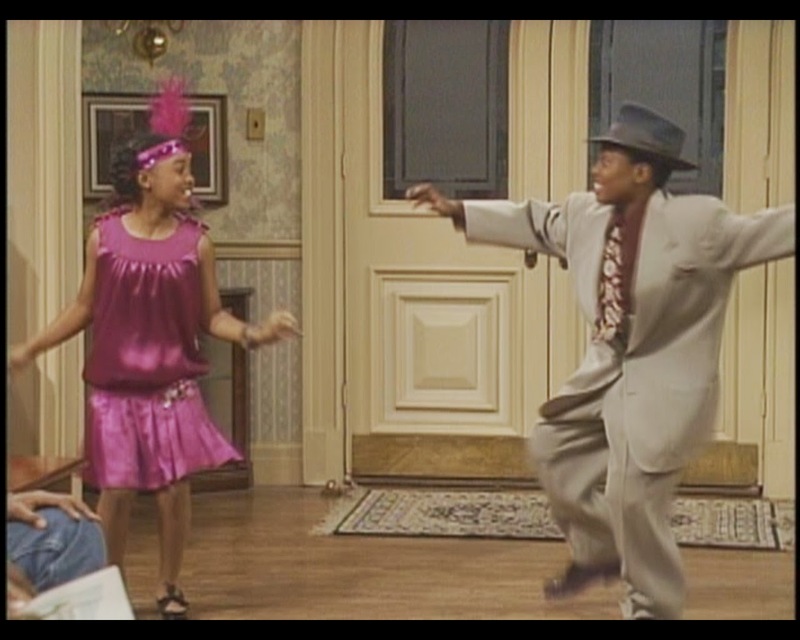 Oh, and that's Z. Wright as her dance partner George. I didn't give him a separate section because of how viscerally I loathe that outfit. I don't know why; my reaction is clearly out of scale with its level of awfulness. It's objectively not good, but it's not as bad as my brain thinks it is. I understand, I just can't change my feelings on this one. You're going to ruin that nice hardwood floor. She's becoming one of my favorites. 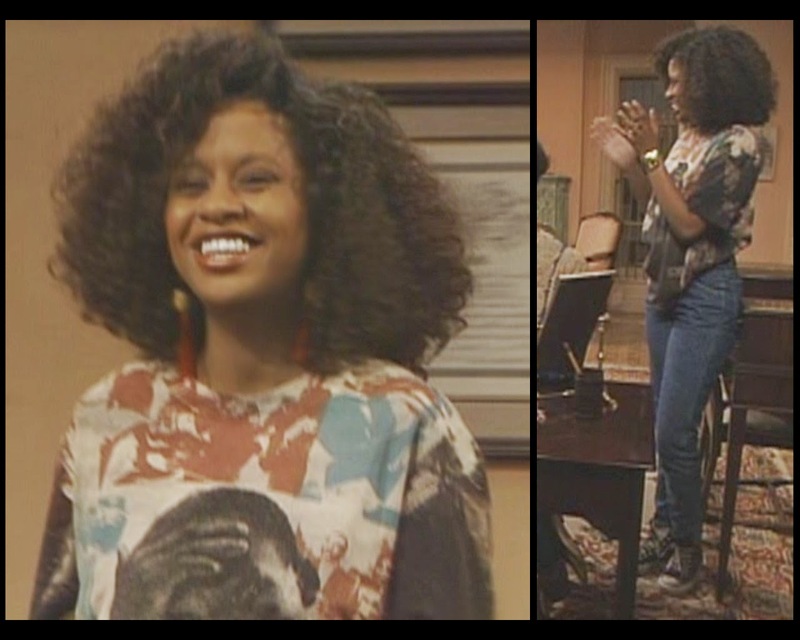 Vanessa starts off in her episode #6.15 coat, which looks just delicious over jeans and a printed t-shirt. I'm usually firmly against shoulder pads, but here they fit. I can't help but adore her retro chic vibe even though I know she wasn't retro when she was wearing it. Even this isn't that bad. This is a repeat from episode #6.3. I like that the previous day, Cliff encouraged her to read more, and here she is following through on that one. 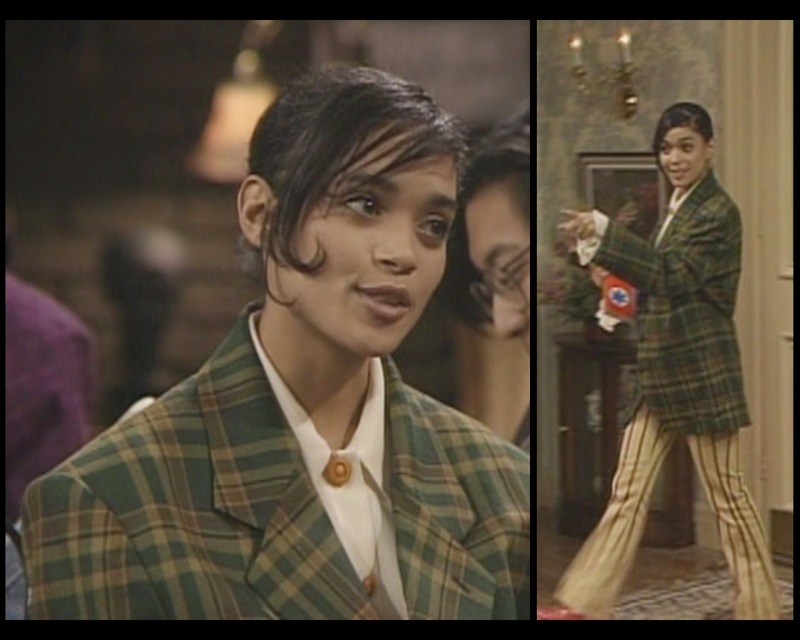 The top half of this look is from episode #6.4, though she's swapped the previous pants for slimmer plaid trousers. While I like the new pants on their own, they kind of make me like the whole outfit less somehow. I think they accentuate how poorly that cardigan fits her. I may never like Theo again. This is Theo's episode #5.12 sweater. He's really into collars that might be a mock turtleneck if you squint. Denise is around for too short a time this week. 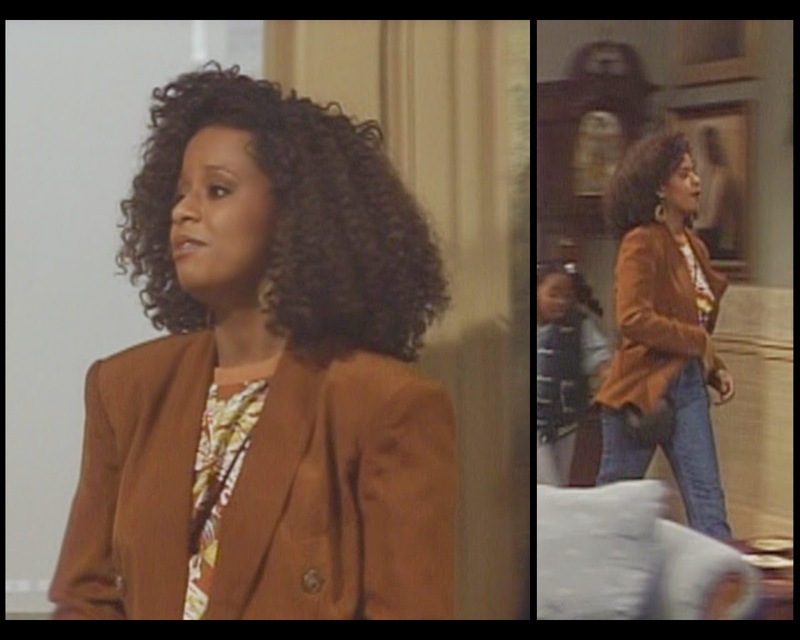 She has stolen Vanessa's episode #6.11 vest and paired it with some sort of supervillain blouse and matching-ish pants. I'm forgiving the poorly-paired aubergine shades because that Maleficent-goes-business-casual collar is sensational. I hope we soon get whole shows dedicated to everyone in Brooklyn stopping to tell her how great her top looks. 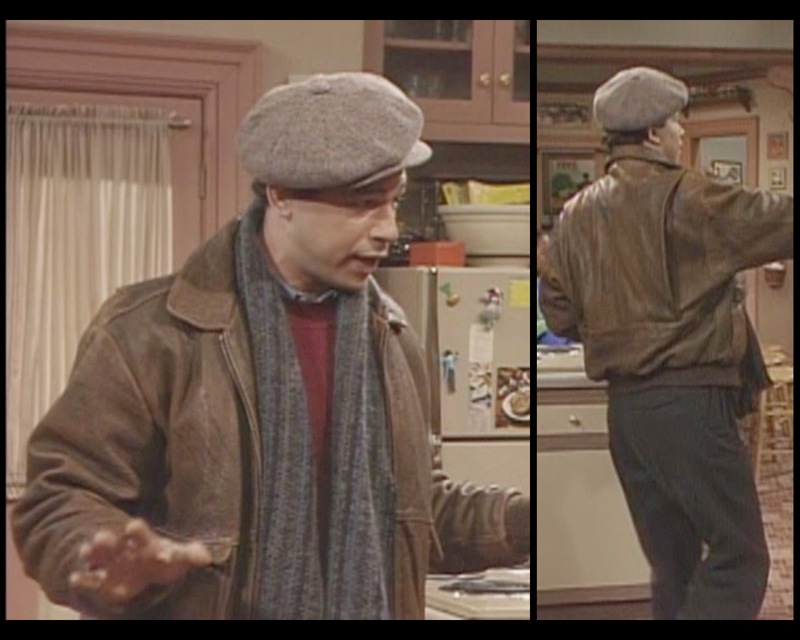 Martin, on the other hand, is committed to those mom jeans. They're pulled up so high, which he makes sure we notice because he tucks his shirt into them. Without a belt, mind you. The green is nice on him, I guess, but buy the man some new jeans already! Her phone faces are always the best faces. I know Clair is trying, but I'm not sure I can support this split turtleneck collar. Otherwise, I'm completely into this situation. The high skirt and sunny blouse are great on their own, but she kicks it into high gear with this fringed top layer. You can't see it in a still frame, but it moves really well; the lower part is cut in this wonderful, graceful curve, and there's a heaviness to it. Something about this coat makes me think I should hate it, but I don't at all. 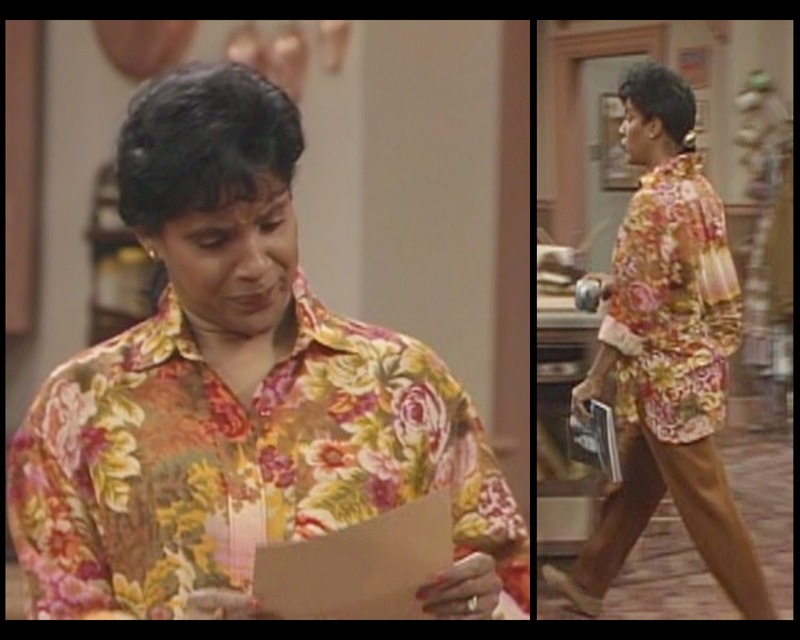 This appears to be Clair's episode #4.21 shirt paired with full-length black trousers rather than the cropped pants from last time. The long necklace is a good touch. Like: look at that face. She's worn this blouse a couple times before (initially in episode #5.3), and it's always divine, but the matching goldenrod skirt takes it to the next level. Unfortunately, that sloppy belt undoes some of the positive impact. It's too flimsy. Otherwise: perfection. He's got some good face, too, obviously. 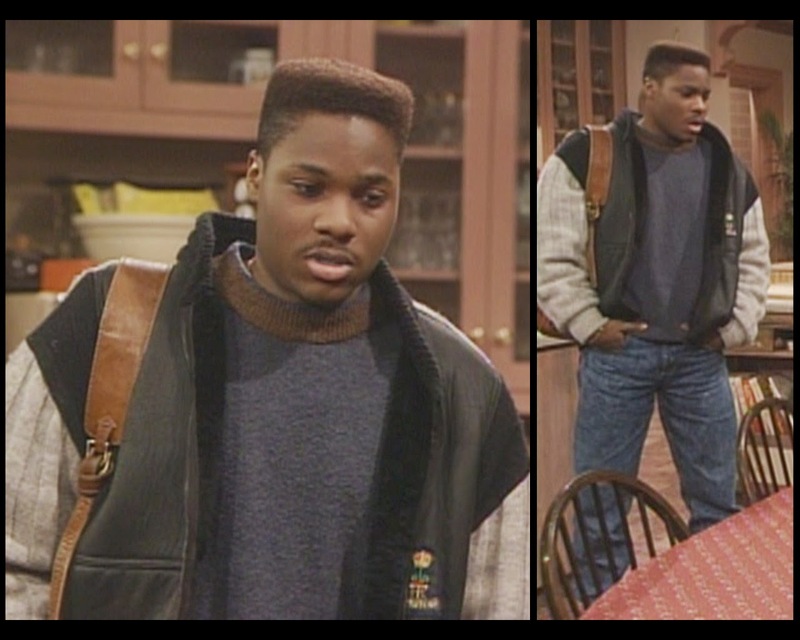 Cliff looks wonderful in his episode #6.17 blue shirt, but he does his best to obscure that fact by pairing it with this vest and those olive pants. And that tie. I can't see much of them, but the suspenders are probably ugly, too. There's a bunch going wrong here. It's a classic case of fantastic individual items becoming crappy when coordinated with each other poorly. In fact, it's hard sometimes to find him looking normal. Remember episode #5.11? This outfit does. It's weird to me that they all dressed up for this living room rehearsal. 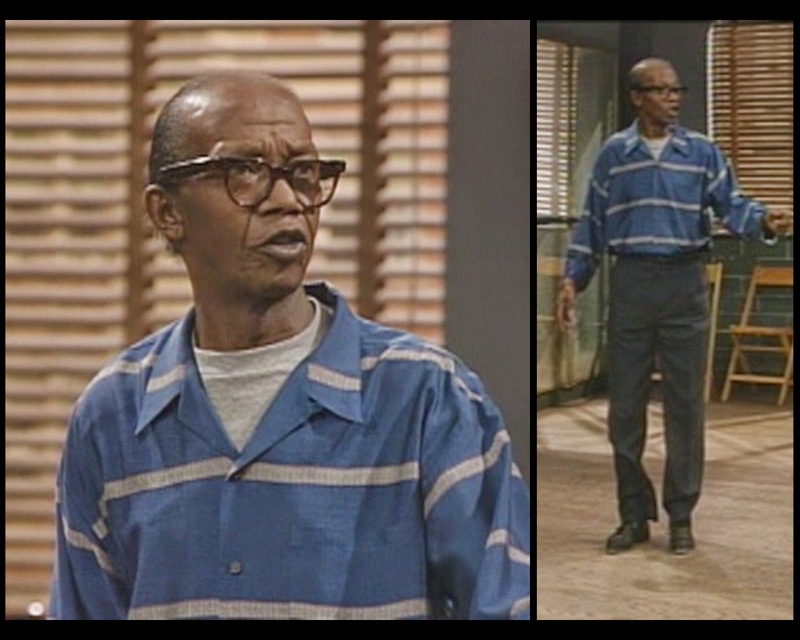 Cliff gets dressed up to watch Rudy's performance. The width of the shoulders on this jacket is out of control. Also, while I usually love a non-standard collar, I'm not thrilled with this one. Let's see how things look once the coat is off. That black square on his collar really bugs me. Gosh, that was a lot. 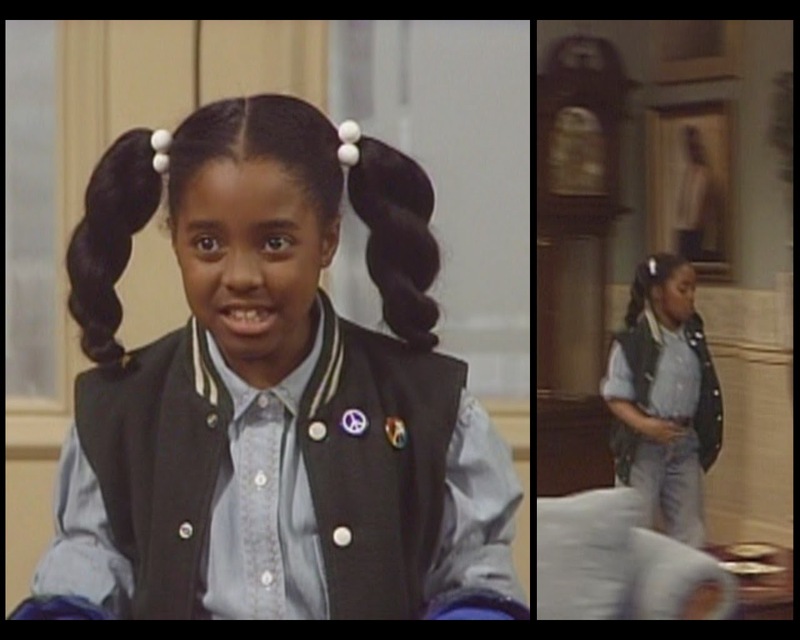 I'm frankly OK with the episodes where the Huxtables fix everything in a day; my life is easier when theirs is. Though still too old to be the cute one, Rudy is also too young to be the rebellious one. 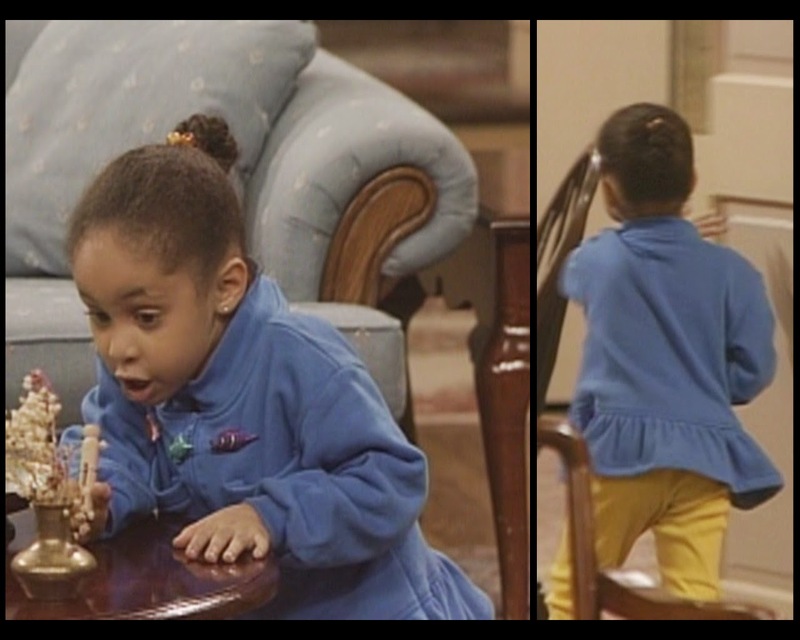 Theo and Vanessa are much better equipped to break rules in outlandish ways, but if we don't figure out something for their younger sister to do, then we're going to have to pull a Denise and write her out of the show entirely. 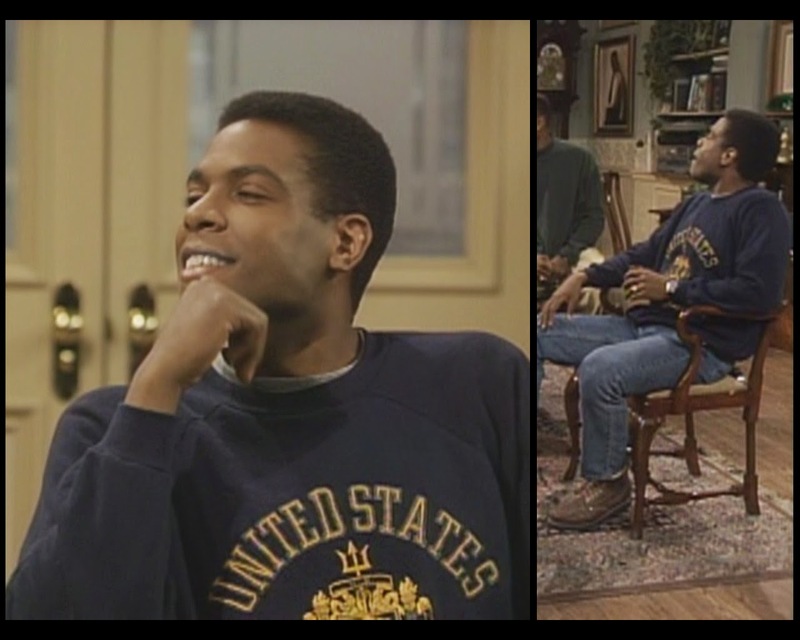 For now, the best the production team can muster is an episode in which Rudy steals $2.30 off the counter to buy a sweatshirt that lights up. 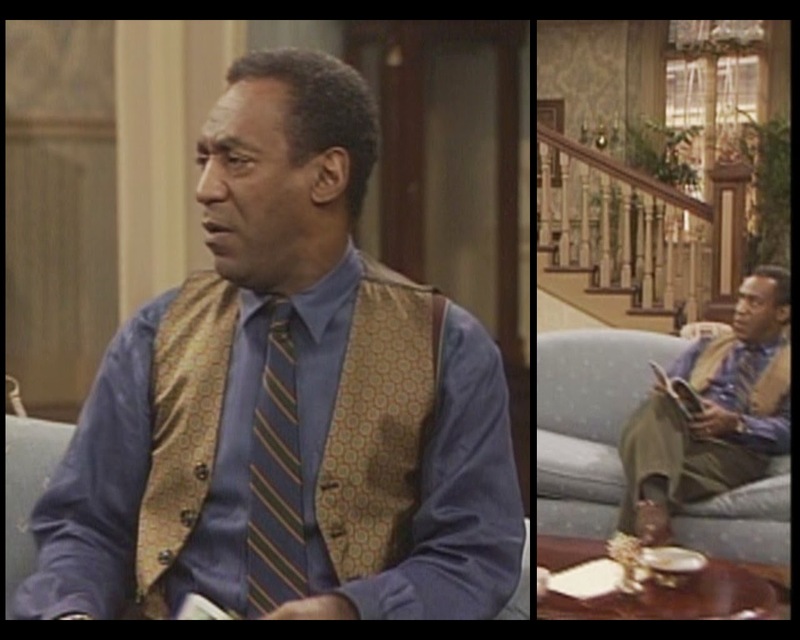 Clair is extremely concerned as to where this money could have gone and only mildly imperious when her daughter confesses to the theft, largely because Rudy owned up quickly, paid the money back, and had nothing but a crappy broken sweatshirt to show for it. So I guess in summation: nothing really happened this week. It all starts when Andy (Gilbert Cruz) comes over to deliver Clair's dry cleaning. She counted out exact change for him, which is honestly insulting because this man deserves a tip, rich lady. Also, when the amount on the counter is insufficient, they act like there's no more money anywhere else in the house. At no point is anyone like, "oh, I'll go to my wallet, which is full of cash because we are wealthy, and get three whole dollars to make up the difference." Anyway, Andy is dressed a lot like Cliff, so I guess the dry cleaning delivery business is good when people aren't short-changing you. Kim also intends to snag one of these pieces of trash, but she's better off in the so-old-it's-new-again, available-at-American-Apparel salmon shirt and leggings. There's a weird chicness to it. When I say freeze, y'all stop on a dime. There is no chicness to Kenny's look. Especially those pants, which may was well be concealing a diaper. STOP THE PRESSES! Olivia finally repeated an outfit. This is the same getup she sported in episode #6.11. Too late. The dance party is over. 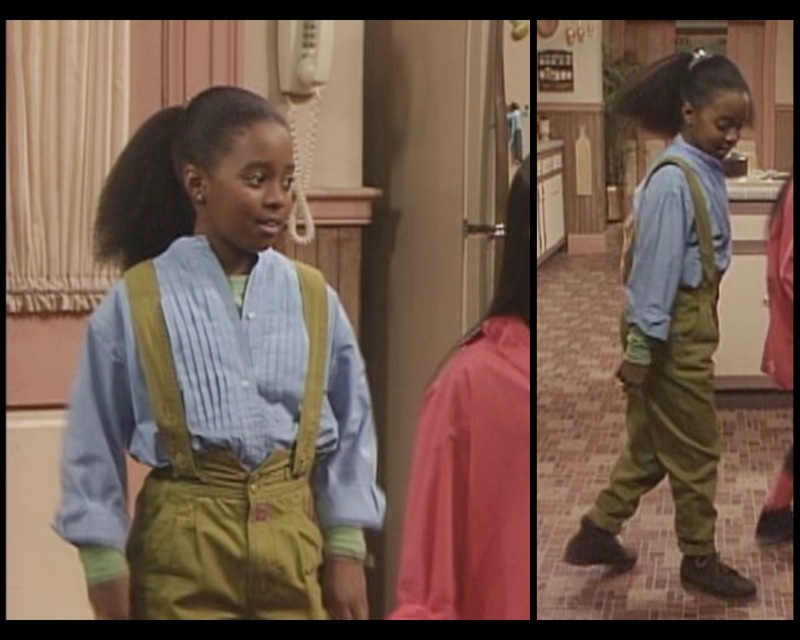 Rudy served up these overalls in episode #6.5, but I think for the most part they pair better with the shirt combo she's employing this time around. The texture, squared collar, and springy colors are lovely, though the sherbet green of her long-sleeved tee clashes outrageously with the chartreuse of the pants. There were so many other options! Would white not have sufficed? 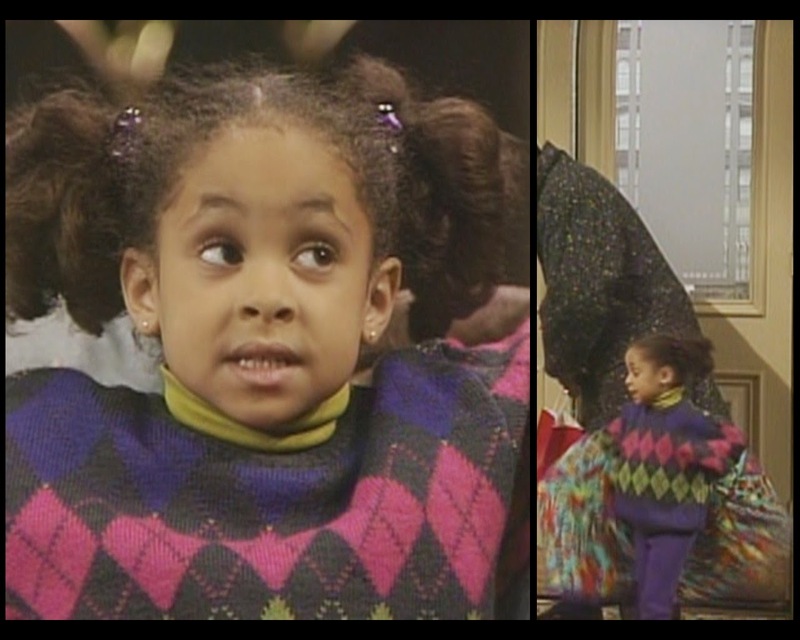 It's uncomfortable how often the Huxtable children beg for money. This outfit combines many of Vanessa's loves: printed pants, shirts with lacy collars, and vests. There's not a lot new to say about these pieces. My biggest complaint is that the yellow pattern on the back seems to conflict pretty terribly with the trousers, though really just about anything would. Those pants are kind of gross. For once, Theo is the lender rather than the borrower. 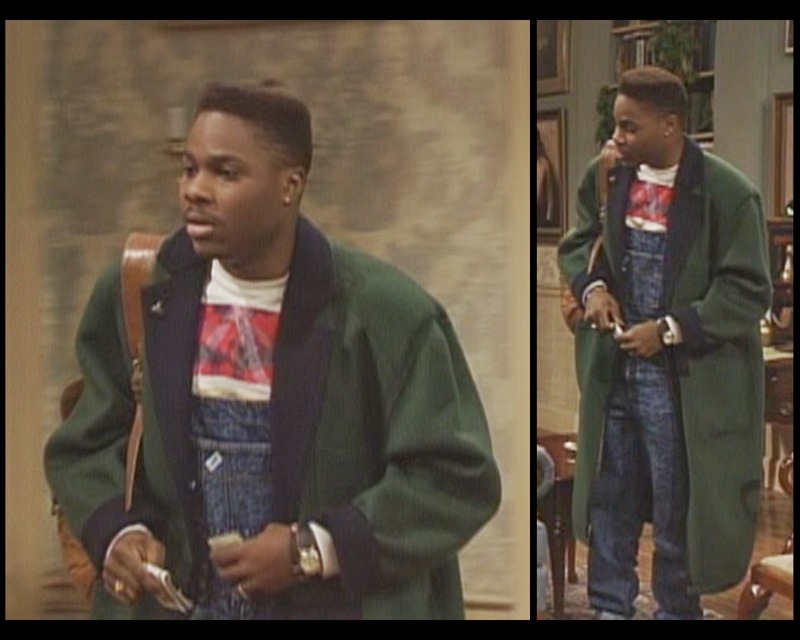 Overprocessed denim overalls and a t-shirt. Great. Whatever she's reading, she sure doesn't like it. 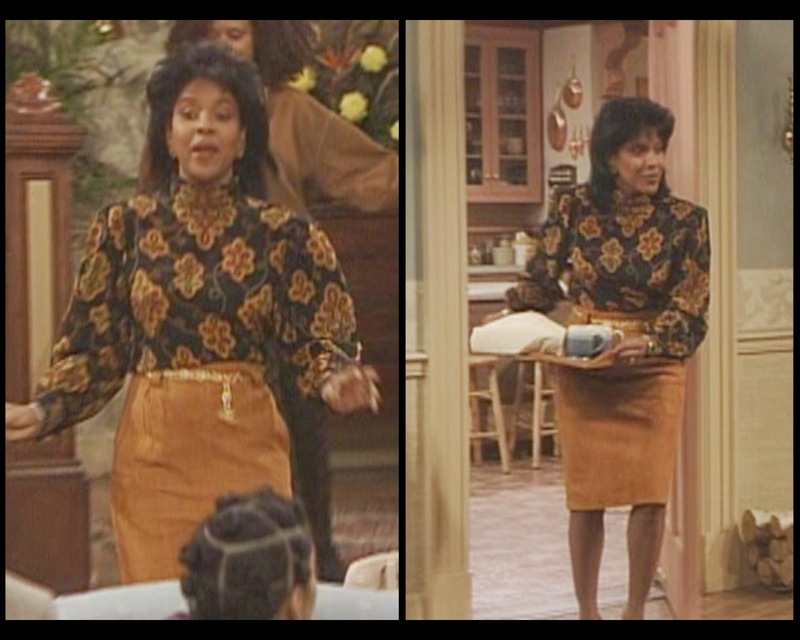 Tonight, the role of grandma's armchair will be played by Clair Huxtable. 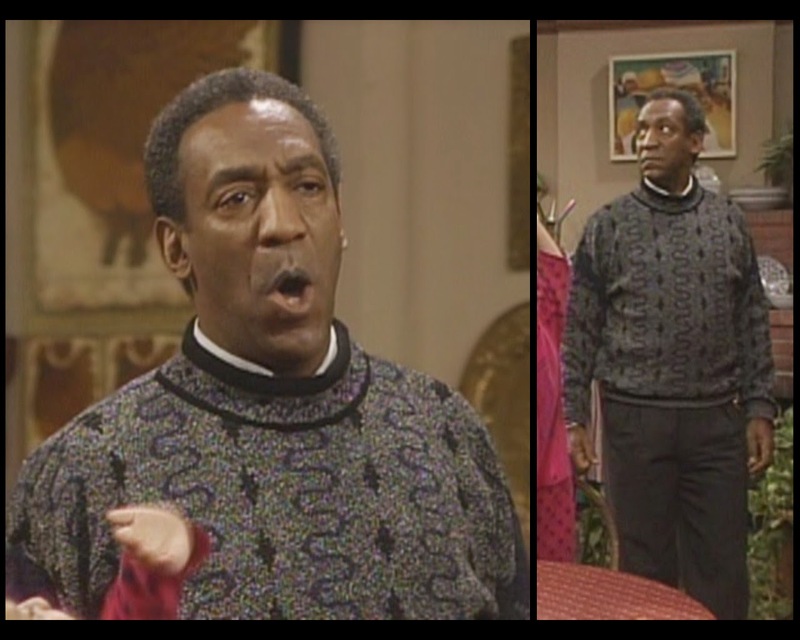 Cliff really digs back into the archives for this one: his sweater is from the first episode of season 3. It has only gotten grungier with age, and looks especially drab and sad when matched with these large, mossy corduroy slacks. The flash of blue at the collar helps, but not much. Mostly he looks like a pile of old rags someone left in the attic. Cross your fingers for some Denise or maybe a formal event for Clair to go to next week. I'm growing weak at the lack of style being displayed around here.